Tens of thousands of workers and supporters converged on the Brigade Parade ground in Kolkata on Saturday to attend West Bengal Chief Minister and Trinamool Congress chief Mamata Banerjee’s mega anti-BJP rally organised to raise voices against the Narendra Modi-led NDA government. 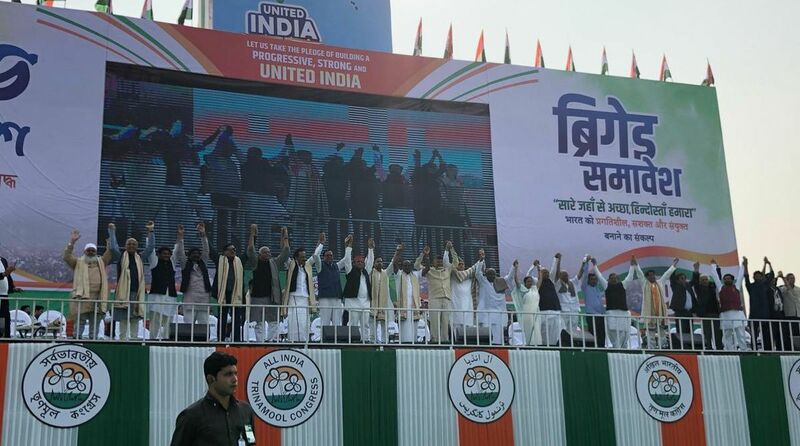 Leaders from at least 20 Opposition parties are present at the United Opposition Rally. Mamata Banerjee reached the venue almost an hour before the rally was scheduled to begin. Here is what some of the speakers at the rally. Gegong Apang, former Arunachal Pradesh CM: “The people in Delhi are diving the country, especially the Northeast. The Citizenship Amendment Bill is an example how a political party is dividing the country. “I have been fortunate enough to work under Indira Gandhi, Rajiv Gandhi, P.V. Narsimha Rao, H.D. Deve Gowdaji, who is present here, Atal Bihari Vajpayee. All those people believed in federal democracy. But the last four years have been testing time for Indian democracy. Farooq Abdullah, National Conference: “It is not the question of ousting any single person (Prime Minister Narendra Modi) but of saving the country and honouring the sacrifices of those who fought for its freedom. H D Deve Gowda, former Prime Minister: “The main task before us is how we should move forward. I have heard all the senior leaders speak. Our time is very short, we have only two months. The only issue before us is how all of us will come together; what our future is. It is a herculean task for all of us to forget our differences and come together. HD Kumaraswamy, Chief Minister of Karnataka: “The non-BJP leaders should join hands and root out the BJP. BJP is merely a paper tiger. We the regional parties are the only ones which can understand and fulfil the aspirations of the people. Arvind Kejriwal, Delhi CM: “If the (Narendra) Modi-(Amit) Shah combine continues to rule the country by winning the 2019 elections, it will change the Constitution and further elections will never take place. A fascist regime will set in as was done by Hitler in Germany. Lalduhawma, Zoram Nationalist Party: “If that Bill (Citizenship Amendment Bill) is enacted…, India will no longer be the place that it used to be… so we want a secular government at the Centre, so that this Bill is withdrawn or exemption must be given to the Northeast.